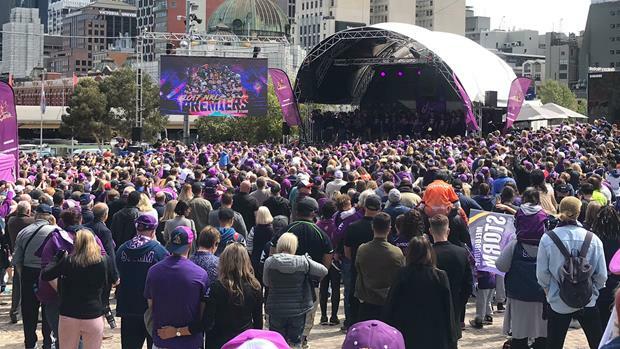 Even the chant of "one more year" by more than 1000 adoring Storm fans at Melbourne's Federation Square wasn't enough to get new dual premiership winner Billy Slater to declare he will play on in 2018. Slater and the Storm players were given a heroes' welcome home after demolishing North Queensland 34-6 to win the NRL grand final in Sydney. The biggest cheers were reserved for skipper Cameron Smith as he held the Provan-Summons trophy aloft, Cooper Cronk, who played his last game for the club in Sunday's grand final, and for Clive Churchill Medal winner Slater. The award capped an incredible comeback after two shoulder reconstructions by Slater, who is still to decide on whether to retire after 299 games. "I'm just going to enjoy today," Slater said when asked about his future. "It's pretty special to turn up here and see so many people and so much support." Cronk also avoided answering a question on whether he will continue his NRL career after moving to Sydney to be with his fiancee. Many of the Storm players donned sunglasses following celebrations that went all night in Sydney. They stayed in the change-rooms at ANZ Stadium until 3am before continuing the party at their team hotel. The heavyweight trophy had already hit the deck thanks to five-eighth Cameron Munster, in probably the only thing he dropped all night, but it remained in good shape. Coach Craig Bellamy said he felt he was in a "purple haze". "Its a good crowd and we had a good crowd there last night - probably the biggest group of Melbourne fans we've had at a grand final I've been at," Bellamy said. "To turn up here to today is just great and we're really appreciative of all the support."